T-Mobile have sacked sporting director Rudy Pevenage after he was implicated with team leader Jan Ullrich in the Spanish blood-doping investigation. Ullrich and team-mate Oscar Sevilla were among 13 riders withdrawn from the Tour de France before the race. Both riders, along with Belgian Pevenage, were suspended by T-Mobile. "The contract linking T-Mobile to Pevenage has been retrospectively stopped on 30 June," the team's general manager, Olaf Ludwig, said on Sunday. The team has yet to make a decision over Ullrich and Sevilla, who were among 56 riders listed by the Spanish investigation. Neither rider has failed a dope test, and they deny any wrongdoing, but both were withdrawn as part of an anti-doping agreement between teams competing at the Tour de France. According to Spanish police files, Pevenage, 51, was a client of cycling doctor Eufemiano Fuentes, who allegedly provided an illegal blood-boosting service and doping products to athletes. The Belgian has advised Ullrich since the beginning of his professional career, overseeing his 1997 Tour victory while sporting director of T-Mobile forerunner, Team Telekom. But Pevenage fell out with team manager Walter Godefroot when Ullrich left in 2002 after being convicted of amphetamines and drink-driving offences. 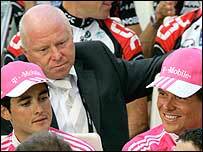 Ullrich was re-admitted to T-Mobile in 2004 but, although his mentor was tolerated as a "personal adviser" by team management, he was not allowed into the team's inner circle. Godefroot retired late last year and, at Ullrich's insistence, the Belgian was readmitted as the sporting director charged with Tour de France preparations.